Navy divers on Thursday found a body in an illegal rat-hole coal mine in Meghalaya's East Jaintia Hills where 15 miners were trapped since December 13, officials said. "One body detected by Indian Navy divers using underwater ROV at a depth of approx 160 feet and 210 feet inside a rat-hole mine," a Navy spokesperson said in a statement. 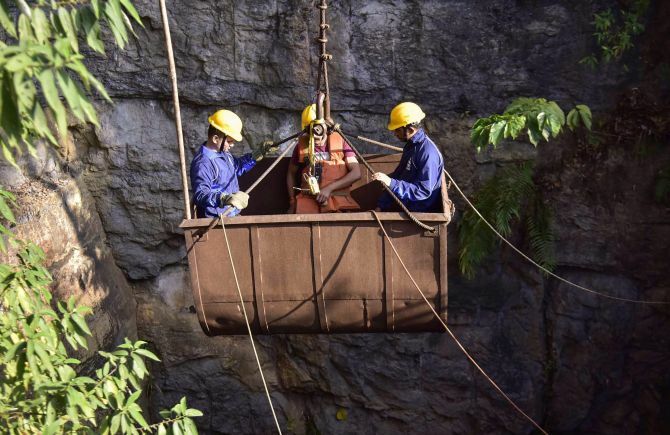 The body has been brought up to the mouth of the rat-hole mine and will be extracted out of it under the supervision of doctors, the officials said, adding the rescue operations were going on. Trapped miners not CM Conrad's problem!